Havalon Knives is a relatively new company, with its roots going back to 2005. However the history goes much further than that since its parent company is dated back to 1980s when they were producing high quality surgical blades. Many hunters and fishermen were using their products around that time due to the sharpness and durability. Soon after, the company realized there are a lot of possibilities on the outdoor market and a new company and line of knives were born. Meet Havalon, the maker of the surgical-edge technology fitted knives for huntsmen, fishermen, and others. The Havalon Baracuta is a folding fillet knife with replaceable blades. These blades offer excellent sharpness and durability thanks to the material used to craft them – the micro-honed Japanese stainless steel. Upon receiving the knife, you can expect them to be immensely sharp. You may be wondering why you would need a replaceable blade. The answer is that these blades are not designed to be sharpened by the end user. Instead, you throw the blade away when it gets dull and replace it with a new one. Ouch, that has to be costly! Well, not really. First, the blades hold edge for quite some time; second, you will receive 5 blades in the package. After you go through all the spare blades, you will have to purchase new ones. The good news is that the pack of 5 new blades will set you back by about 15 dollars. That’s pretty cheap, right? 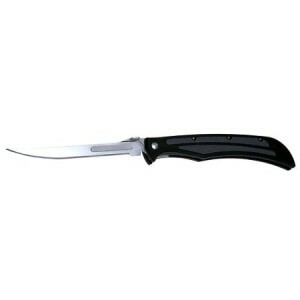 This knife will arrive with 5-inch blades which are suitable for most small and medium fish. When it comes to flexibility of the blades, they are slightly less flexible than traditional fillet knives. So bear that in mind, if you are used to high flexibility. There are also other types and sizes available, such as bone saw blades or 4 3/8-inch blades, which you can order separately. What we really love about the replaceable system is the convenience it provides. Instead of having to sharpen the knife on a fishing trip when it gets dull, you just replace the blade within matter of seconds. The handle of the knife can be either black or black-orange. We preferred the black version as the black-orange one made the knife look like a tool you would use in a garage. Together with the knife and spare blades, you will receive also a neat sheath. The sheath is fitted with a pocket for the spare blades, so you will minimize the chance of losing them out in the field. The Havalon Baracuta Z enjoys thoroughly positive reviews in many stores. As of the time of writing, the knife had high average rating. Many of the customers praised the model for its convenience and sharpness. In this Havalon Baracuta Z review, we took a look at one of the best rated folding fillet knives currently on the market. It shines where the convenience of having the replaceable blades comes in handy – e.g. on longer fishing trips. What you should be aware of is the slight lack of flexibility in the blades. Otherwise, this is an excellent product for a relatively low price. Click here to buy the knife from Amazon!